Our turkeys are raised outside on pasture on a diet supplemented with fresh fruit and vegetables and a top quality organic feed. Whole turkeys are available fresh right before Thanksgiving and Christmas and, occasionally, frozen at other times of the year. Price for whole turkeys (the only way we sell them) is 6.50/lb. Birds tend to either be on the smaller size (8-12 lbs) or larger size (13-17 lbs) with occasional individuals reaching more than 20lbs. Please note that because we only produce small numbers of birds each year it is best to order well in advance of the holiday season. We are sold out of Thanksgiving birds for 2013. 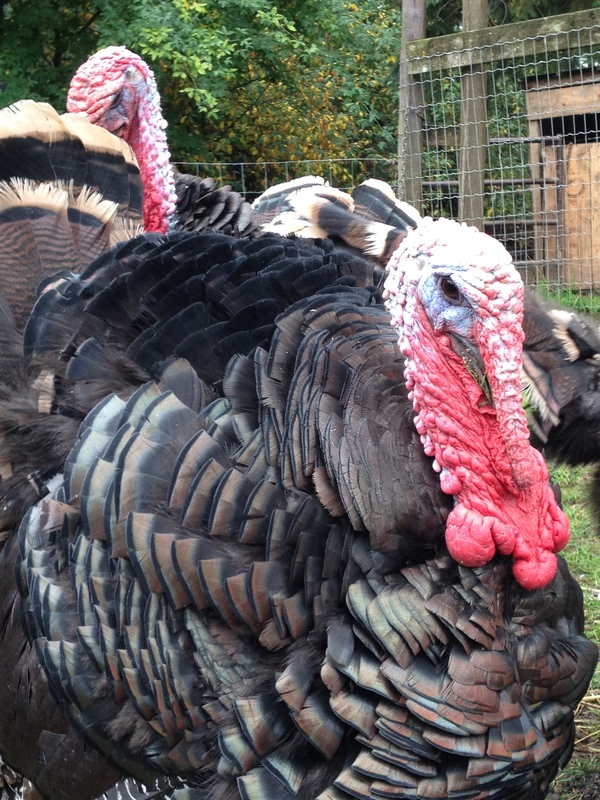 Update December 21, 2013 – we are sold out of Christmas birds for 2013. Thank you everyone for your amazing support this season! Being a retired welder/metal worker I built a large cook pan that fits nicely into my bbq/smoker pit. I cook my home grown bronze turkey over a low heat using mesquite for my smoking wood. Oh, that does sound good… I don’t have a cast iron pan large enough, unfortunately. Or a smoker, for that matter. Obviously I have another project or two to add to the list! Thanks for stopping by. So lovely. Do you sell hatching eggs? That sounds like a deal! Ridley Bronze are very hard to come by!